Arab Fire Safety & Security Academy introduces fire fighting training represented in qualifying program in firefighting . This fire fighting training name is Extensive Firefighting . Who should take this fire fighting training ? Everyone works in firefighting . Those who are assigned to fight fires in different work sites . Personnel in petroleum, commercial, administrative and industrial institutions. 1.Identify the physical and chemical properties of fire. 2.Identify all materials used in firefighting operations and their properties. 3.Practical training on the use of manual fire extinguishers. 4.Practical training on the use of personal protective missions. 5.Practical training on the use of ladders and ropes. 6.Practical training on how to ventilate the fire place. 7.Training on the use of safety equipment. 8.Recognize the dangers of various building materials. 9.Training on the maintenance of machinery, equipment and fire hoses. 10.Compiling information about the risks of the hazardous material through the use of emergency response guide (ERG). 11.Identifying the physical and chemical properties of hazardous materials. 12.Setting tactics to control hazardous material incidents. 13.Remove the impact of pollutants of hazardous material incidents and clearing the scene and the affected areas. 14.Developing leadership and supervision skills. 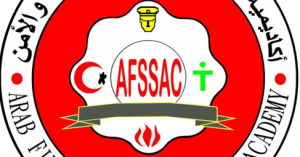 15.Practical training on how to fight different liquids and gases fires. 16.Practical training on the use of rescue tools and equipment. 17.Identifying the detection and fire alarm systems. 1.The development stages of fire behavior. 2.Types of buildings and their various elements. 3.Individual protection clothes and respirators. 6.Forcible entry and its equipment. 11.Detection and fire alarm devices. 1. Educational level: General secondary (scientific section), Industrial secondary Certificate and its equivalent. 2. 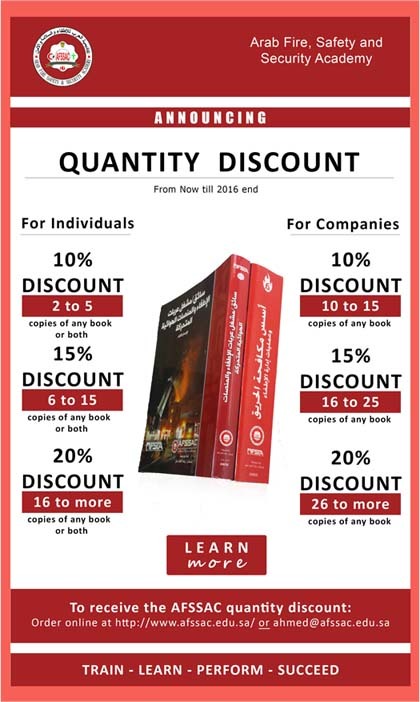 Basic Requirements: obtaining a qualifying courses in firefighting. * Duration of the program: four months – five days a week -480 training session (40% theoretical 60% practical).